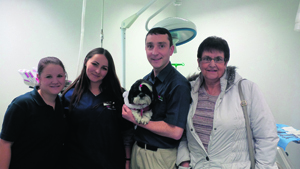 A Filton vets’ practice has celebrated 10 years of service to the town. Vets4Pets on Gloucester Road North held a special party before Christmas at which owners - and some animals - came along to say thanks and take a tour of the surgery. Owner Michael Parry - a Filtonvoice columnist - told pet owners how proud he was of his team in Filton before cutting a birthday cake. Along with his team, he gave visitors a look ‘behind the scenes’ at the operating theatre, x-ray room, cattery, pharmacy and consulting rooms. Anne Curtis from Henbury, a regular with her dog Millie, said she was delighted to join in the celebrations. Michael said: “We are very grateful to all our clients for their support over the past 10 years - they really are wonderful.